LONDON, England -- The United States and its European allies are in talks about harsher sanctions against Moscow, while U.S. President Barack Obama will evaluate next steps in dealing with the conflict in eastern Ukraine in coming days, U.S. Secretary of State John Kerry said on Saturday. 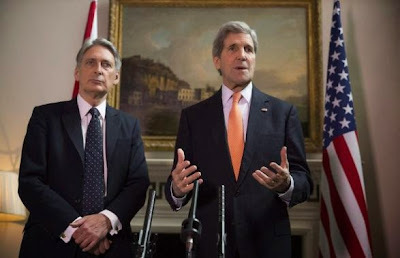 Britain's Foreign Secretary Phillip Hammond and U.S. Secretary of State John Kerry (R) deliver a statement at a press conference in London, February 21, 2015. Kerry was speaking after meetings with his British counterpart Philip Hammond in London. He said among options being considered by Obama was whether to arm Ukrainian forces and to impose deeper sanctions against the Kremlin for breaches of a Feb. 12 European-brokered truce. "In the next few days I anticipate that President Obama will evaluate the choices that are in front of him and will make his decision as to what the next step will be," Kerry told a news conference after meetings with Hammond. "There are serious discussions taking place between us and our European allies as to what those next sanctions steps ought to be and when they ought to be implemented," Kerry said. "I am confident some additional steps will be taken in response to the breaches of the ceasefire." The Kiev military on Friday accused Russia of sending more tanks and troops towards the rebel-held town of Novoazovsk, further east along the Sea of Azov coast from Mariupol, expanding their presence on what it fears could be the next battlefront. The Kremlin did not immediately respond to the allegation but has always denied accusations that its forces are fighting in Ukraine. Kerry said the most "egregious violation" of the ceasefire was the assault on the city of Debaltseve and military supplies sent by Moscow to separatists. "We know to a certainty what Russia has been providing and no amount of propaganda is capable of hiding these actions," Kerry said. "For anyone wanting to make gray areas out of black, let's get very real, the Minsk agreement is not open to interpretation, it is not vague, it is not optional." He said Russia and the rebels were only complying with the ceasefire accords in a few areas. "If this failure continues, make no mistake, there will be further consequences, including consequences that will put added strains on Russia's already troubled economy," Kerry said. "We are not going to sit back and allow this kind of cynical, craven behavior to continue at the expensive of the sovereignty of another nation." Pro-Russian separatists are building up forces and weapons in Ukraine's southeast and the Ukrainian military said on Saturday it was braced for a possible rebel attack on the port city of Mariupol. An attack on Mariupol, a city of half a million people and potentially a gateway to Crimea, which Russia annexed last March, would almost certainly kill off the ceasefire that aimed to end the 10-month-old conflict. Kremlin spokesman Dmitry Peskov told Echo Moskvy radio station that Russia was focused on supporting the ceasefire deal, according to TASS news agency. "An obsessive idea to force someone to pay the cost ... is not conducive to the resolution of the situation in southeast Ukraine," Peskov was quoted as saying, in response to Kerry's remarks on the possibility of further sanctions against Russia. The ceasefire has already been shaken by the rebel capture on Wednesday of Debaltseve, a railway junction in eastern Ukraine, forcing a retreat by thousands of Ukrainian troops in which at least 20 Ukrainian soldiers were killed. Hammond said the ceasefire had been "systematically breached" and he would discuss with Kerry how Europe and the United States could remain united in tackling the challenge in Ukraine. The Secretary of State travels to Geneva on Sunday for two days of talks with senior Iranian officials on Tehran's disputed nuclear program, as the sides try to resolve differences before a March 31 deadline for a basic framework agreement. U.S. Energy Secretary Ernest Moniz will also attend the talks, the first time he has participated in the Iran negotiations, a U.S. official said. Kerry said because of the nature of the nuclear talks it was deemed necessary and appropriate to have technical experts, including Moniz, present. "I would not read into it any indication whatsoever that something is about to be decided as a result of that," he said. "There are still significant gaps, there is still a distance to travel."